It’s VJ Day: Do you know where your grandfather was? On August 15th (August 14 in the US), Japan surrendered, ending the long struggles of World War II. One would think that the end of a war that cost millions of Asian civilians their lives would cause rejoicing, but a lot of news organizations are ignoring the story. The New York Times, admonished last year by a veteran when they ignored the anniversary, makes up for their lack by telling his story. The bad news? They wrote the story as a cliche,Â following the meme “Veterans are victims” and “hundreds of thousands of Americans died”, along with a reminder of how the war ended: by using the atomic bomb….the implication is that all wars are bad, and the US was equally “evil”. No mention of the Japanese militant tryanny that ordered the slaughter of civilians in China, or whose frustrated soldiers killed Filipino civilians during their withdrawal from Manila. Roger Gross, owner of the Franklin Rogers Ltd. clothing store in Providence, says the holiday boosts resorts and other tourism businesses along the coast. Yes, he said “every other country we beat up over the years“. Yes, it is no longer politically correct to thank those who fought against Hitler and Japan (dead 30 million), communist Korea (whose deathmaking continues: two million dead of starvation in the 1990’s) , in Viet Nam (where an American withdrawal resulted in a communist takeover that caused one million boat people to flee, a quarter million dead in reeducation camps, and ten million dead in the killing fields of Cambodia). and Saddam Hussein (one million dead, but since they were Iranians or Kurds, they don’t matter to the American anti war movement). So history is being rewritten. This is the time of Obama, no military heroism allowed, folks, just move along. Yet this blackout of history is not limited to the US media: The Manila Bulletin, for example, has an editorial celebrating the “liberation of Korea” from the brutal Japanese occupation of Korea, which started in 1910. But the editorial doesn’t connect the dots to the reason behind the liberation, merely mentioning that the end of the occupation was due to the Japanese surrender. One wonders how much of the historical amnesia is due to present day political correctness, with the “anti war” intellectuals in the US who don’t wish to acknowledge the heroism of their grandfathers, and the “Philippine patriot” left here disliking America so much that they don’t want to acknowledge that their grandfathers fought and died along side Americans against a hated Japanese occupation. Of course, here in the Philippines, the war left a lot of sad memories, so even my husband claims he “can’t remember” if they celebrated the end of the war. Perhaps it was the horrors of civilians caught in the crossfire, or perhaps it was the atrocities against Filipino civilians, or perhaps it is rememberance of the grim fate that awaited the Japanese stragglers that make the end of the war something that needs to be forgotten. 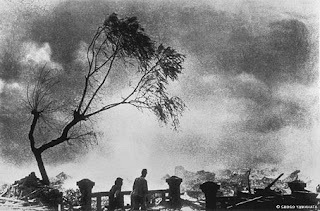 Several Japanese films discuss the episode, but they make grim watching, although some Japanese see it as showing the heroism of soldiers who suffer for love of country. 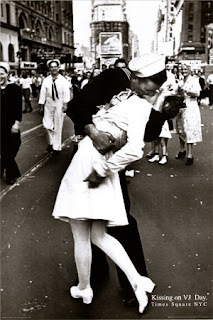 It is a sailor kissing a nurse in New York City. The photo always reminds me of my cousin, who also was a young sailor during the war. His ship was hit by a kamikazi, and while on leave, like most of his shipmates, he figured he’d die during the invasion of Japan. So he spent his leave partying, and one day he woke up from a bender, and left the apartment by jumping off a fire excape, breaking his leg. A lot of the silence is due to the fact that the War was ended by an atrocity: the dropping of an atomic bomb. Few people arguing about dropping the bomb realize that the estimate of US casualties if Japan had been invaded was one million….and, given the resistance and mass suicides on the outer islands of Saipan and Okinawa, the estimate of exoected civilian casualties among the Japanese was expected to be several million…. So dropping the bomb allowed a lot of folks to live (and not all of them Yanks) but that doesn’t mean that dropping the bomb was “right” (it was, however, probably the least bad of several bad options). AFondnessForReading blog reviews the classic Japanese book Bells of Nagasaki, written by a survivor who lost his family in the bombing. The precious jewel of life…. Dr. Nagai lost his beloved wife in the blast. He fought his own battle with leukemia before his death, trying desperately to postpone the day when his two children would become orphans. He was a deeply religious man, a devoted father, and a compassionate healer and teacher. During the last years of his life, when he was confined to bed due to the ravages of his atomic bomb disease, he wrote many books, poems, and papers in the spirit of peace. His writings, a powerful plea for peace in this atomic age, touched the hearts of many people around the world. He died in 1951. Yes, those were days of a sad joy, but one is sad that so few in the media are trying to remember what that day meant to those on all sides of the struggle. So, do you know where your grandfather was on August 15, 1945? And is he sad that no one wants to hear his story in our brave new world of peace? 6 users commented in " It’s VJ Day: Do you know where your grandfather was? " Great article, Nancy! Thank you! And, yes, I know where my grandfather was on VJ Day. But even more important, I know where he was on the morning of Sunday, December 7, 1941. He was on Pearl Harbor when the Japanese attacked the U.S. and started the war in the Pacific. AND I do respect the many times that America has had a positive military influence in the world. I also know where my father – a former Marine – was on VJ Day – in the South Pacific fighting the Japanese. Nancy – a respectful word of caution – when you’re slamming the left for being politically correct and “no heroism” allowed, you’re insulting a lot of decent, hard-working Americans who served and who just happen to be politically on the other side of the aisle from you. You might want to consider that. Hi to both, another OBama supporter who remembers VERY well.My grandads were already passed.I am 77yrs..My Dad is now buried in our cemetery.He died in Southern France Oct 1st,1944.I remember the atrocities very well!!! I was only 12 but I understood and I cried.I still find it hard to forgive.My Dad is gone.I still cry..Dad fought with the 45th Infantry,ThunderBird division.Anzio,Naples,Cassino Rome,Marsielles (you know the French who dislike USA)..Grandvilliers was the end.Noreen. Our local stations did remember. Oh yes, a bit of an add on.My husband fought in Korea,was there when the WAR ended.The younger generation cannot fathom the attrocities of the second world war.The pictures,movie tones were terrible to see let alone live. Those poor people. So let me make a correction: Those of us from the Kennedy/Clinton left fight for our country. (Clinton did save Kosovo). And the good news is that President Obama is ignoring those anti war activists who put him in office.